Polished Concrete is the Look of Today that Requires Very Little Maintenance. 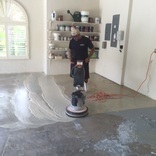 Polished concrete is the rage in decorating, and is just starting to gain popularity in our area. We start our restoration process with a low grit pad to remove all surface wear and imbedded dirt. We then work our way up to an 1800 grit and then apply a sealer polish that bonds to the concrete and will not yellow or fade. During the honing process, we can add color, either solid or opaque. You pick from stock colors, or we can mix to match your preference. Once the color is added, it will never change or be removed and can be honed again without removing the color. If you ever want to change color, we can do so with a deep hone, change the color, and then polish the floor to a high shine again. Once completed, the new polished concrete floor will shine for years to come. For garages, the surface will repel oil or other fluids, will be less slippery than unpolished concrete, and will require much less care and cleaning.